McALLEN — The government alleges a county bailiff used his access to official documents to help facilitate drug rips from drug trafficking organizations. “Absolutely unbelievable,” and “people over here are shocked,” were some of the responses from people in and around the county after learning of the federal charge against Oscar De La Cruz, a seasoned court officer at the Hidalgo County Courthouse. After a criminal complaint was made public during his initial hearing Monday morning in federal court, friends, local attorneys and colleagues shared their feelings of shock and disbelief, days after learning of De La Cruz’s arrest in connection with a conspiracy to traffic cocaine. Those feelings continued to permeate among attorneys and court staff circles throughout the county as the 52-year-old Pharr native’s role in a conspiracy to move more than 5 kilos of cocaine became a little clearer. De La Cruz, husband of nearly 30 years to his wife, and father to at least two adult children, one of whom recently became an assistant county attorney in Travis County, is seen by many who know him as a friendly, nice and loving family man. The judge De La Cruz worked for the past two years in County Court at Law No. 6, Albert Garcia, left nearly speechless after news broke of his bailiff’s arrest, characterized De La Cruz as a “straight-arrow,” noting he was a man of God, who was very involved in his church and community. 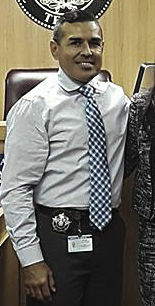 De La Cruz, who stood before U.S. Magistrate J. Scott Hacker wearing blue jeans, a white long-sleeve t-shirt, a pair of reading glasses and handcuffs chained to his waist, looked more like your everyday-civilian than the distinguished well-dressed, congenial court officer persona he had cultivated for decades. De La Cruz said very little during his appearance in federal court, where he was joined by his attorney, Edinburg-based Santos Maldonado, heard the allegations made against him in Hacker’s courtroom. Hacker outlined the government’s allegations, which showed the government sought to connect De La Cruz to an unnamed drug trafficking organization, specifically. They allege De La Cruz helped procure false court documents for people working with the drug trafficking organization to help facilitate the theft and reselling of cocaine. This is a common practice utilized by those who are attempting to deceive the main supply source of, in this case, cocaine. By producing an official court or police document they can legitimize their loss of the product to the supply source in Mexico. One similar notable federal case took place a few years ago. In 2016, Hector “Jojo” Mendez, 47, of Pharr, a then-Mission Police and Drug Enforcement Administration task force officer, was convicted of cocaine smuggling and was found to have used a similar tactic of procuring false documents for suppliers in Mexico. Mendez was found guilty of federal drug charges in a 2016 trial related to his arrest on cocaine conspiracy charges — he is currently serving his second year of a 25-year prison sentence. The conviction stemmed from a federal investigation into Mendez for his alleged role as the organizer in a drug conspiracy. The government alleged that on July 28, 2012, Mendez staged a seizure of approximately 14.9 kilos of cocaine in Mission during the search of a vehicle in a local restaurant parking lot. Prosecutors alleged that days before the staged seizure Mendez had diluted the cocaine in order to cover up the fact he had stolen some of it and resold it for a profit — something the government said Mendez had done in the past. Mendez’s attempt to cover up the staged seizure in the days and months that followed led to the filing of “sloppy” or inaccurate reports that got the attention of his supervisors at the DEA. That led to the investigation and Mendez’s eventual arrest in the summer of 2015. The complaint, filed Friday and made public Monday, states that beginning in October 2017, FBI agents were given information from a cooperating source, known as CS 1, who stated he paid another cooperating source, CS 2, to get a hold of fake documents that showed drugs had been seized by law enforcement authorities in 2016, and 2017, the complaint states. In De La Cruz’s complaint, CS 1 and CS 2, outlined how they worked with an official at the county courthouse to get their hands on “fictitious,” court documents — which helped them steal the substance from suppliers. “CS 1 stated he provided said false documents to the controlled substances sources of supply to make it appear that law enforcement seized the controlled substances in CS 1’s possession, which allowed CS 1 and others to retain possession of the controlled substance for further distribution,” the complaint states. Eventually, one of these ‘fake” documents — ended up in the hands of federal agents. “In Nov. 2017, FBI Special Agents obtained a copy of one of the fraudulent documents obtained by CS 1 and CS 2. The document lists a case number and states that it corresponds to a search allegedly conducted at an address in Edcouch, Texas on March 5, 2017. On that day, DEA agents seized 6 kilos of cocaine from an Edcouch residence, the complaint states. Judge Hacker set De La Cruz’s detention hearing for Tuesday afternoon, where it is possible he sets a bond. Maldonado, who believes the government would not be opposed to the court releasing his client, is hopeful De La Cruz will be released on bond — citing his lack of a prior criminal history and significant family ties to the area.